It’s no secret that people earn extra household income in various ways but how you spend that money will either help you become richer in cash/investments, stuff or experiences. Perhaps you could have all of these but if you’re not careful you could waste away opportunities that could see debt vanish, savings increase and desires fulfilled. Just recently a friend of mine went from being on unemployment after a job loss to scoring a career opportunity that would see him earning over $80,000 a year. His new job allows him to travel with paid company benefits covering all costs.He also has an extensive benefits package which includes a pension, health and wellness. Now his dental and prescriptions are 100% covered as these were expenses he used to pay for out-of-pocket. While charring in his back garden over a beer he joked about what he would do with all his extra household income. I thought it was a valid question and certainly one to discuss. Some people just up and blow the extra household income but that might not be the smartest route to take especially if you still have looming debt. 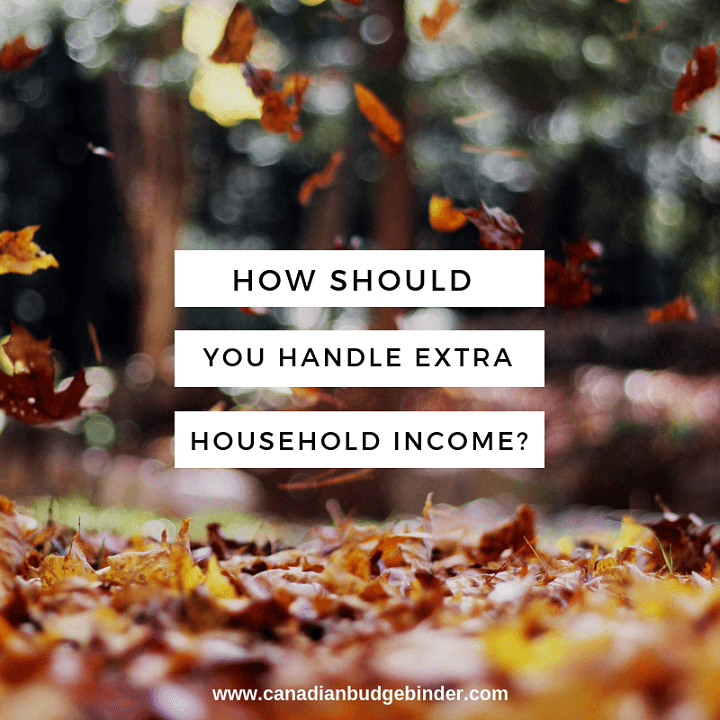 What is the difference between income and extra household income? Let me take a moment to explain income to people want a bit of back history about what it is. Income is money that is earned or given that has or has not been taxed by the government and deposited into your bank account, given to you in the form of cash or a cheque or any other legal form of financial acceptability in Canada. If you earn extra household income it can be any of the above which extends what you earn on a typical basis. You don’t necessarily need to have a job to earn extra household income however when you get a raise at work, start a new job with a higher salary or wage you may have concerns on how to handle the money. A friend of ours just had a second baby and the government now gives an annual benefit of $6400 per child under the age of 6. Since the family is low-income they receive the max amount allowable which equals $12,800 a year. This is household income that they never had before but is much needed to help them while the mother stays home to care for the children and the father is in school for an apprenticeship and working full-time. Our family earns just over $100 a month for this allowance which is money we save in a registered savings investment for our son. Another scenario of earning extra household income might be getting a raise at work. When I started working I was only earning $15 an hour. Over the years and with experience I moved up to over $30 an hour and since we budgeted our money based on my income which included the mortgage at the time this extra household income came in handy. 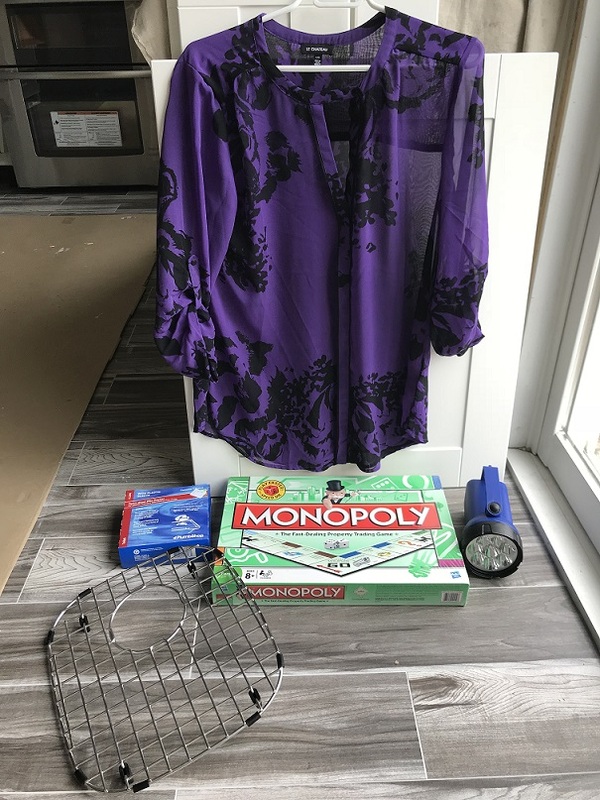 If you are someone who likes to buy and sell items, host garage sales or work for cash all of this money is extra household income that you didn’t have before. Your friend might ask you to help fix his car if you are a mechanic and pay you $100. If you’re a plumber you might install a water heater for a friend of a friend for $200. All of this is considered extra household income. What if you were walking down the street and stumbled upon a $100 bill and you knew it would be impossible to find the owner? (I’d still try) This found cash is extra household income since it is money you didn’t have included as part of your monthly budget calculations. If you won the lottery you still need a budget and although that’s my opinion don’t go crying when you’re broke. It happens. This type of extra household income is dangerous and amazing at the same time and must be handled with care. An inheritance whether it was expected or not is money that you didn’t earn and was given to you can be added to your extra household income income section of the budget spreadsheet. A big at work no matter what industry you work in is money you didn’t have when you started your shift. Keep in mind that controlled tips, direct tips and declared tips all must be claimed on your income tax return as income earned. Direct tips in the Province of Quebec in the hospitality industry must be declared to the employer.The good part is that tips are not mandatory so what you get is technically a bonus depending on where you work. We have participated in doing focus groups since 2009 and have made quite a bit of extra household income that has helped us increase our monthly net income. Just recently Mrs. CBB sat through a 2 hour focus group at a local hotel talking about a pressing local issue and when she was done she was given an envelope with $100 in it. Not too shabby for hanging out and giving her opinion. As you can read there are so many ways where someone can earn extra household income that leads us to where should the money go. Some people may choose to spend it on trips, clothing, or items they’ve always wanted and never had the money to pay for it. Others may use it to invest or start-up a new business venture. With my frugal mindset I’d take the extra household income and splash it on any debt that was owed first. Whenever we would take in household income that was not part of our regular schedule it would go towards our mortgage. This is a big part in how we paid our mortgage off in 5 years. This is the way we chose to distribute the money which worked out great for us since we’ve been able to increase our savings power which includes maxing out our retirement investments. This is not for everyone though since it takes a certain dedication however the benefits to us were mind-blowing.Currently we’re working on transitioning our term life-insurance to a possible whole life-insurance as a savings outlet although we are investigating all of our options. For others going on holidays with extra household income might be the first way to spend the money they receive whether it was saved or earned in a chunk. My buddy was talking about adding a deck to his house with the extra household income as well updating his kitchen but before that he said he’d rather pay off debt. Smart guy but that’s just my opinion. I think he just wanted reassurance from me since he knows we are mortgage free. I don’t often talk about it with random people but my two best buddies know. Sometimes the best thing you can do is offer your experiences to others who you feel could benefit but also remember that everyone’s situation is different. Let’s go over a few ways you could put that extra household income to good use. Buy a house, Sell your house or get into the real estate market for the first time. This is the order in which we would use any extra household income sort of like a tier debt-payoff method since debt is not something we care to carry. Your tier may look different but consider the impact the money you spend will have on you and is it the best option or the option that makes most sense financially. Discussion: What would you do with extra household income? Start a conversation and share your comments below. 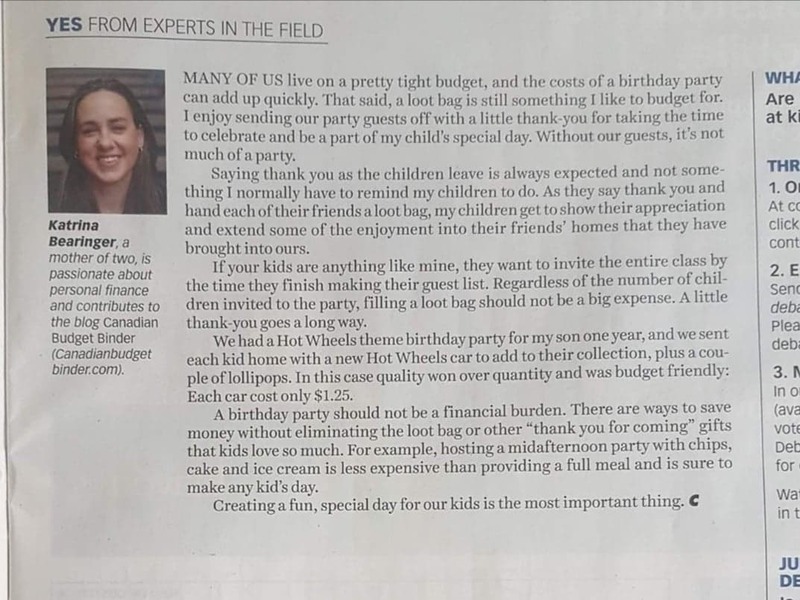 The last couple of weeks have been busy and fun with our son turning four years-old and starting Junior Kindergarten to Fall festivals and finding out casual CBB writer Katrina Bearinger was featured in the Costco Connection magazine for August 2018 representing CBB. If you have that magazine flip to pages 14 and 15 to read the article titled, “Are loot bags necessary at kids’ birthday parties” to read what she had to say. Now that the leaves are starting to fall and the night’s are getting colder that means we will be starting our outdoor clean-up shortly. This year we built a new fence which trampled our back lawn. I’ll be working on bringing that back to life with some Fall fertilizer so next Spring we hope to get that lush green lawn back. Other than that life is getting busy with our son in school and having to make sure he’s in bed by 7pm which means we’re in bed. We still haven’t gotten him in his own room yet. We have been working on potty training him to go number 2 which we thought was going well but he’s reverted back to the diaper, going in his pants and overall wanting to stay in bed all day to holding it in. Perhaps that’s the way it goes but it has been overwhelming for us especially with him starting school this week. I’m sure this school year we will see him finally in his bedroom so we can own our room again. Parenting is NOT easy and we all make mistakes but trying to fix them can take the life right out of you. Here are my garage sale finds from this week! 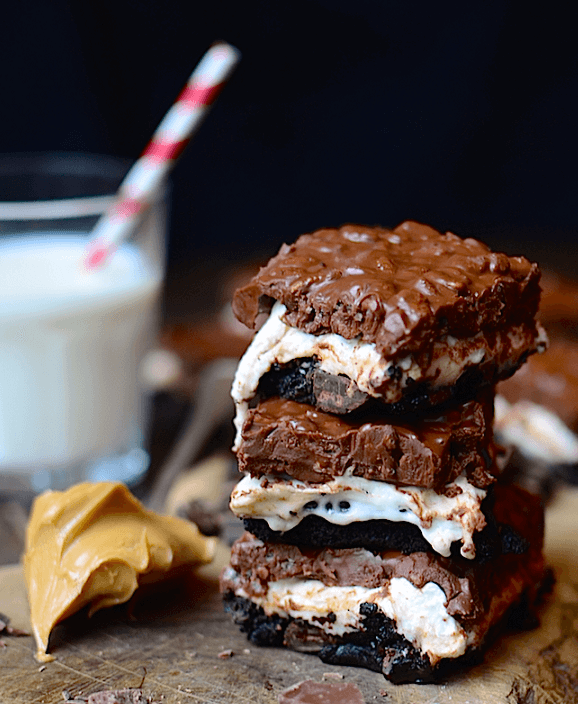 Yammie’s Noshery won me over this week with these decadent Flourless Marshmallow Crunch Brownies. How can you not look at these and want to sink your teeth into them. As a brownie lover I enjoy when bakers go above and beyond with brownies from classic to Amazing!! Since the Fall has swooped in at least in the evenings and the leaves are falling I’m going to go ahead and start sharing budget FALL DIY projects. The first one I wanted to start with is from Pins and Procrastination who shares a simple recipe for this homemade all natural pumpkin lotion. I know many of my fans on Facebook talk about making their own deodorant so I thought this might interest them as well. 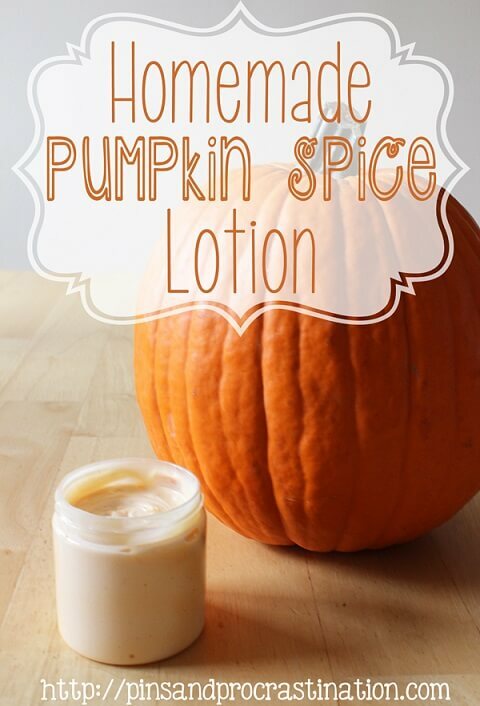 For all of you pumpkin spice lovers making your own beauty products may be far more economical than buying it. Just have a look at the ingredients and you’ll see that essential oils have many purposes and in this case a little goes a long way. Do I have to pay for streaming? – Um, ya! Foodland Too Expensive- Tell me about it however there are deals if you look if you have time to go a few times a week. What must “I” do to become wealthy- Wish “I” knew. 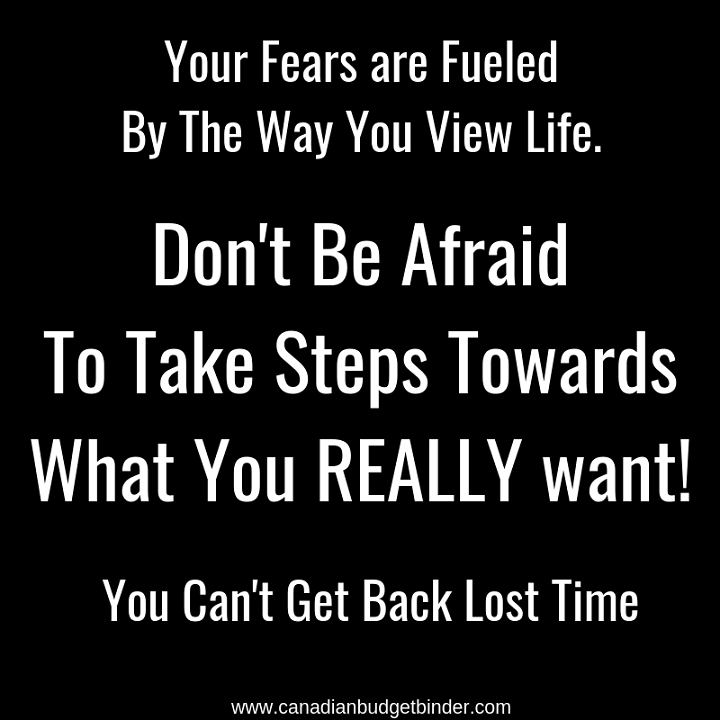 I would be hesitant to pay off mortgage debt or any low interest bearing debt. If there’s the ability to generate a higher return in the markets through investing then you should prioritise saving and investing ahead of these low interest bearing debts…surely? I guess it’s up to the investor on this one as we’ve been through this conversation quite a few times.Not everyone can invest on their own and as you know investing does cost money. If one can 100% net more then go for it otherwise it’s a risk and what we knew for sure is that without the mortgage we were able to invest more without the stress of worrying about a monster mortgage debt. Not everyone can invest and keep in mind when you are investing with an advisor those MER fees will steal a chunk of any windfall… even long-term. We’re happy with our decision and haven’t looked back! Thanks for stopping by.